The world is a hard place - and it usually gets harder when you're following God. That's unfortunate, but it's the truth. God calls us to some extraordinary things and other forces work hard to slow us down. Call it Satan, the world, or as Paul does, principalities. I grew up in church. Most Sundays we'd get dressed and head to the First United Methodist Church of Valdosta. The church had three sections of pews (not a wedding or funeral friendly sanctuary) and our "reserved" seats were on the right side, five rows up from the back. From there, you could see everything that was going on and you didn't interfere with the old ladies' space or singing. I remember a lot about that sanctuary. I remember the embroidered kneeling pads at the altar, the ceiling that looked like they had turned an old ship upside down and made it a building, and the stained glass windows. Most Sundays my eyes would catch one window in particular - the one facing Patterson Street that, at 11am on a Sunday, the sun would light up, showing a picture of Jesus rescuing Peter from the waves. I wish I had a picture of that actual window. It's been a reminder to me of who Christ is to me as a minister. I think if I were in a similar boat today with several other people, I might be the one to give walking on water a try (chalk that up to naivete). I've talked about it before - God has created a magnificent world that still needs to be reconciled to him. He emplores us to step out in faith and do his work in that world and sometimes, that's as extreme as walking on water. 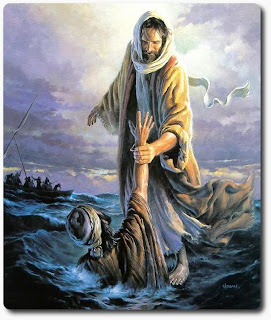 The beautiful part of faith is that walking on water is possible because we are empowered by Christ - Peter proved it! Paul wrote, "I can do all things through Christ who strengthens me" (Phil 4:13). Men and women throughout history have proven that the impossible is in fact possible, with the help of God. Right now, with the church having adopted a new vision and set out in a new direction for ministry, I'm feeling a lot more like Peter. I've been walking on water for about 28 months now, one miracle and leap of faith after another. I certainly don't get credit for any of that. I find myself, like Peter, wanting so bad to look back to the safety of the boat. Remember? That was Peter's "downfall." He was unsure of his own ability to follow Christ and began to sink. The further out I get, the more my spirit cries out for the boat. The more a shrug off reasonable warnings, the more I hear the voices calling from the boat. In just these last few weeks, the distractions have been incredible - from staff issues, to low worship attendance, to a flooded church building, to personal identity theft, to church budget strain, to antagonism from certain long-time church members, and back again. I've decided that in this denomination I love, there is one weakness to the United Methodist Connection that sometimes hinders ministry. I could write for days on the benefits to being itenerant - both for the ministers and for the churches - but too often it becomes a safety net, or rather a safety raft. The ability to cut-and-run is a temptation. As a church member and staff member of other churches, I've seen it first hand. When the heat gets too high or the challenges too great, everybody's got a way out. The minister who feels overwhelmed can move to another church and start over with new circumstances. The church that feels too challenged by the pastor can ask for him (or her) to move and start over with a new voice in the pulpit and the board meetings. Does this stunt the growth of the church? How many have been close to making a difference for God in the church or the community and have turned back to the boat? How different would the world be if every minister was given a minimum appointment period of, say, 10 years? Revolving door churches would be forced to consider working toward a vision. Frequently moving pastors would be required to actually do something with their lives. Don't share any of this with my bishop though. While this has its merits, there are some places I wouldn't want to be "stuck" for 10 years. In the meantime, I'm trying hard, against all odds, to keep my eyes locked on Christ and his purpose for my ministry and my life. I'm putting one foot in front of the other and resisting the temptation to look back to the boat. I know that I wouldn't be satisfied with the boat - so I keep moving forward, toward true satisfaction and fulfillment. Thank God that when Peter sank, Jesus didn't let him drown. That stained glass window I told you about, it showed Jesus pulling Peter back out again. Thank God for the gift of grace and the opportunity to live perfect lives without the expectation that we will. Has anyone close to you gotten the H1N1 yet? A friend of mine in Colorado has had it and another one locally has as well. One was miserable and recovered pretty well, the other tried to be a tough guy and ended up in the hospital on a ventilator (he's fine now by the way). Turn on the news. Every media outlet is talking about the vaccines that are slowly becoming available to prevent us from contracting swine flu. Will you go get vaccinated? There are upsides and downsides to every vaccination. Because of vaccines, we've eradicated things like polio. Now there are concerns over whether these drugs cause things like autism, but it's still a risk that many are willing to take. Why? Because the virus or disease you could get otherwise is awful enough that you want nothing to do with it. Sadly though, many people look at their faith as a vaccine by itself. There's a belief that many hold that if you believe in God and trust your life to him, that everything will be just fine. You'll develop an immunity to hardship, poverty, disappointment, and tragedy. Unfortunately, when people believe these things, and bad things happen to them, usually the first response is anger at God for not having prevented tragedy from striking. I've seen it too many times. One husband and wife that are members of this church and still live in the community will never be seen coming to church. Why? Because they're angry with God for a tragedy that struck them six years ago. Another friend has completely turned away from God because he's dealing with terminal cancer and feels betrayed. Major staff problems that have now resulted in beginning to search for a new staff member. A death in the congregation. A near-death in the congregation. A two-story flood in the church building from a busted water fountain. Communication breakdown with a leader that I trust and respect greatly. and as of Sunday night at 10:30, I'm dealing with personal ID theft. Forget it. I'm going back on vacation. I've come to realize that often times when we choose to follow Christ and serve Christ in life, we don't become immune to hardship. We actually become magnets for it. Think about it. If you're doing good things for the Kingdom of God, who isn't going to be happy? So what do you think Satan is going to do about it? He's going to try to slow us down or stop us altogether. Two days after the leadership of this church had a serious discussion about making better use of our facilities for community ministry, the building flooded (it was literally raining in the youth hallway). It was a setback. Good came out of it though. We're getting a new paint job in our youth and children's ministry areas which we desperately needed. Paul says to the Corinthians, "I will boast all the more gladly about my weaknesses so that Christ's power may rest on me. That is why, for Christ's sake, I delight in weaknesses, in insults, in hardships, in persecutions, in difficulties. For when I am weak, then I am strong." Christ's grace is sufficient, his power is made perfect in our weaknesses. Here's the Good News: God doesn't cause the bad stuff to happen - that's a part of the broken world we live in. BUT, because God is who he says he is, we never have to go through the hard times alone. In fact, when we do, we endure only by our reliance on Christ to get us through. I'm leaning on God a lot right now. That means I'm leaning also on other Christian brothers and sisters. I've got a lot of ground to cover, but I know that by the grace of God, it will all be done.